Prep this simple Spinach Pie Recipe in just ten minutes. 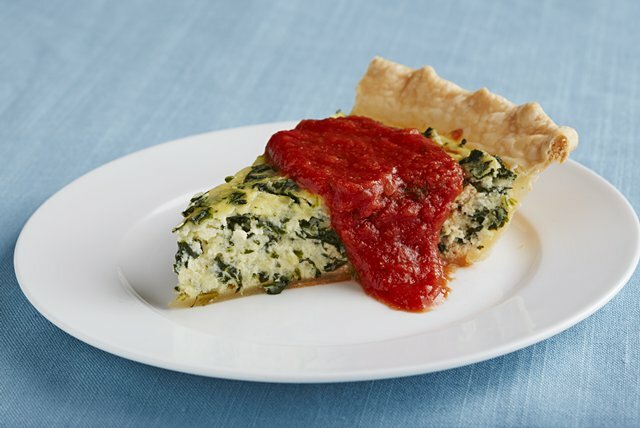 This Spinach Pie Recipe is so easy to make thanks to frozen spinach and a ready-made pie crust. Preheat oven to 350°F. Mix spinach, cheeses, eggs and nutmeg. Pour into pastry shell. Bake 45 to 50 min. or until center is set. Let stand 5 min. Cut into 8 wedges. Serve topped with the pasta sauce. For a delightful brunch idea, serve this entree with a seasonal fresh fruit salad. Substitute KRAFT Shredded Cheddar Cheese for the mozzarella cheese, TACO BELL® Thick & Chunky Salsa for the pasta sauce and ground cumin for the nutmeg. Cover edge of pie crust with strip of foil for the last 15 min. of the baking time to prevent it from browning too much. Makes 8 servings, 1 wedge each.